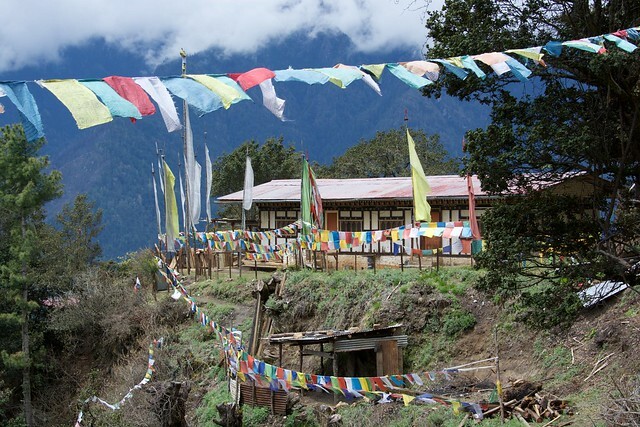 If there’s such a thing as utopia, it exists in Bhutan. You’d be hard-pressed to find a place more pure of heart. 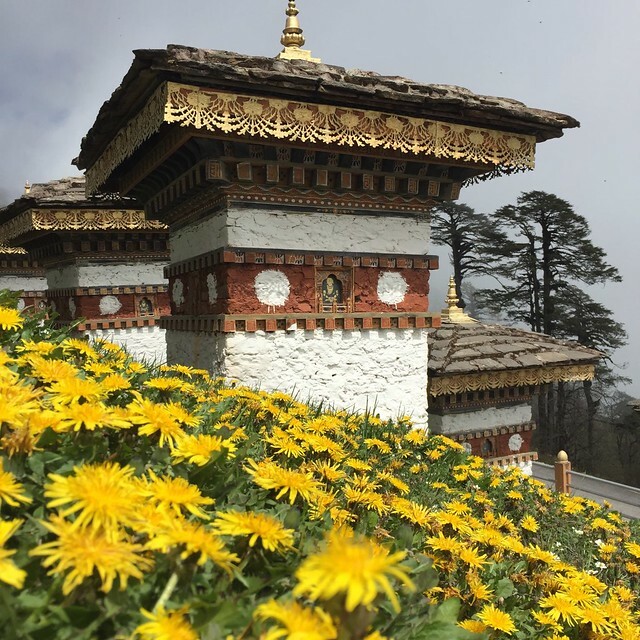 Indeed, Bhutan grabbed the world’s attention when it chose measure its success against Gross National Happiness rather than material development. 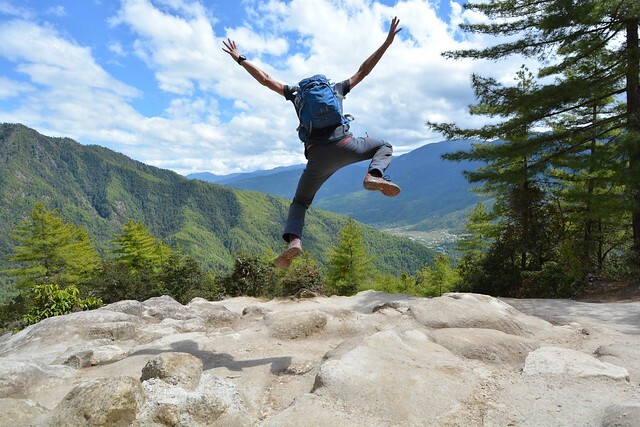 But, what does Gross National Happiness mean exactly? 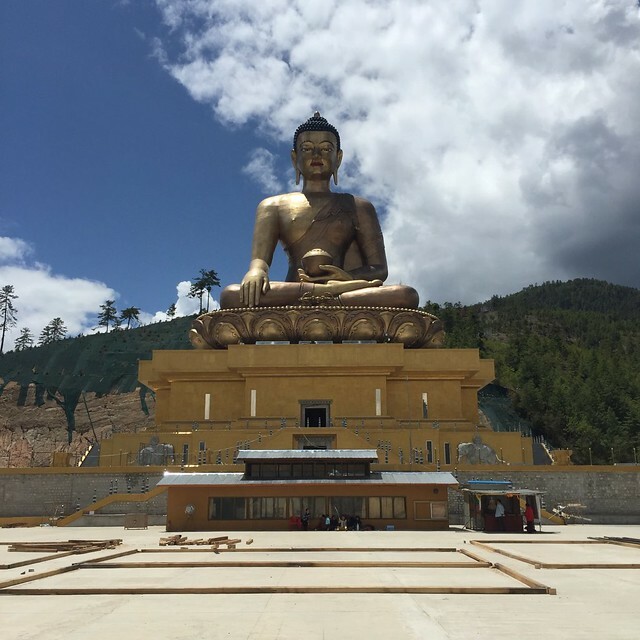 Is there more to Bhutan’s bliss than a government paradigm? 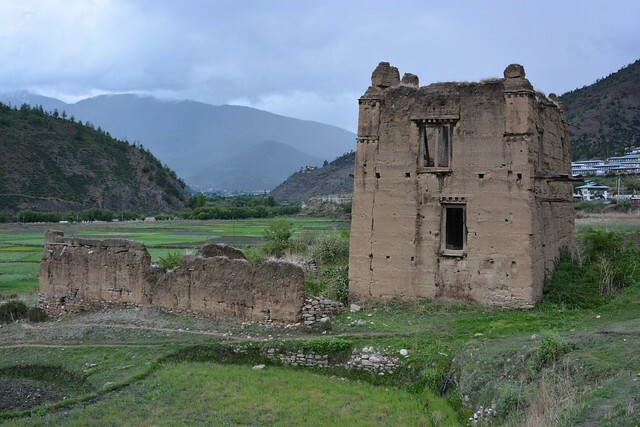 This pocket-sized country, nestled quietly amongst the clouds, is shrouded in mystery. 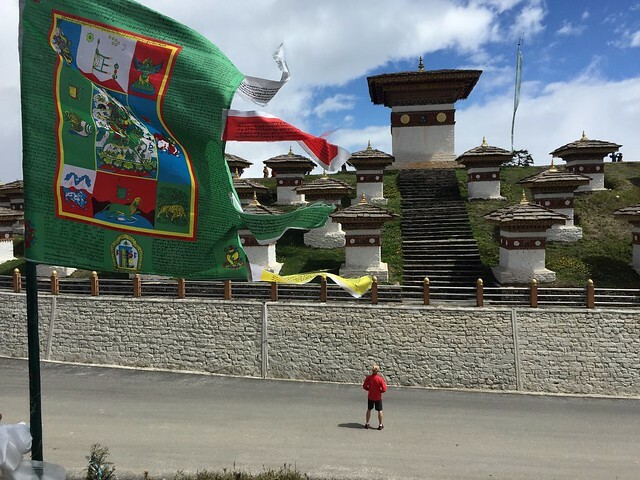 To better understand Bhutan and what makes it tick, Ben and I decided to spend a week exploring its dramatic landscape and quaint towns. During that time, we interviewed a monk in a monastery, a nun on a mountaintop, royalty in hotel, an NGO Program Director at a festival, and our wonderful tour guide whilst on the road. The Bhutanese have it right. From the moment little ones can walk ‘n’ talk, they are taught about happiness and how to bring it into their own lives. In fact, schools include happiness lessons in their curriculum! Lesson #1: focus on developing admirable human qualities. When you meet a Bhutanese person, you instinctively sense they’re a good egg. They come across as friendly, patient, compassionate, disciplined, humble, genuine and ultra respectful – qualities which are instilled in them throughout their entire lives. Motivated by their devout Buddhist beliefs, they’re pure of heart, mind and intention. It brings them joy, inner peace and a whole lot of good karma. 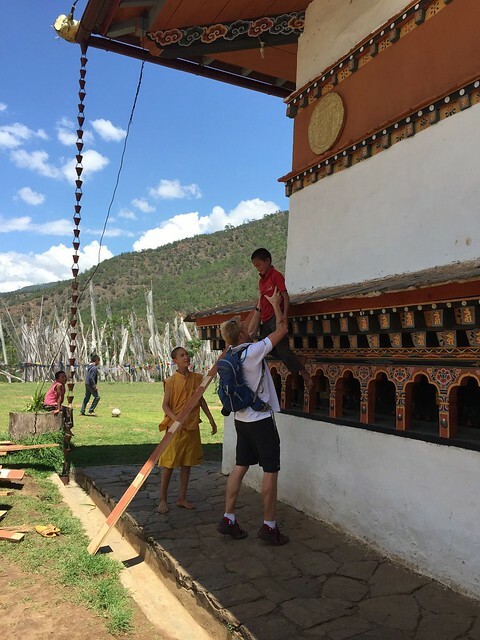 The Bhutanese ensure their core values (Buddhist and beyond) are front and centre in their lives. In many other parts of the world, it’s a case of “out of sight, out of mind”. People lead work-oriented lives until December comes around when they remember to spend time with loved ones, help members of the community, touch base with their spirituality, and re-evaluate their goals. By January, all is practically forgotten and back to work they go. Their day-to-day lifestyles don’t don’t reflect what’s truly important to them. As a result, they feel stressed, dissatisfied, lost and down in the dumps way too often. 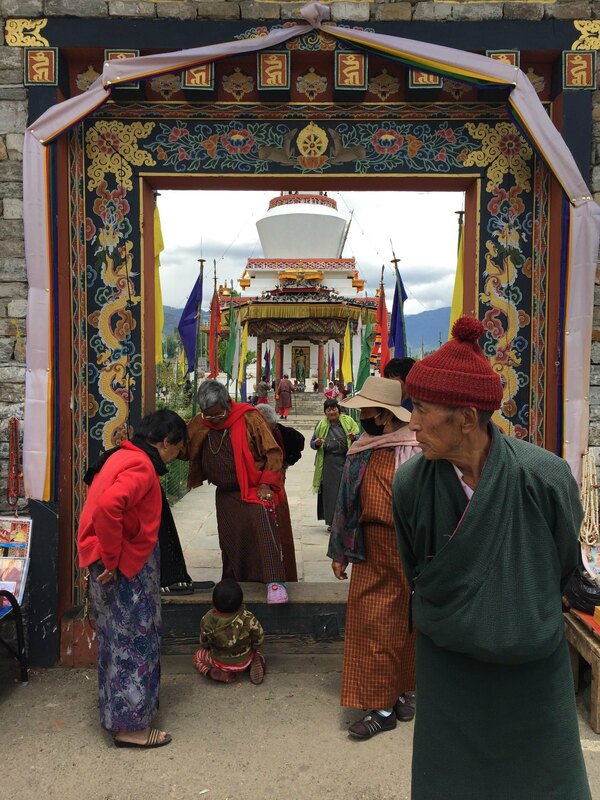 For the Bhutanese, Buddhism is thickly woven throughout every aspect of their lives. 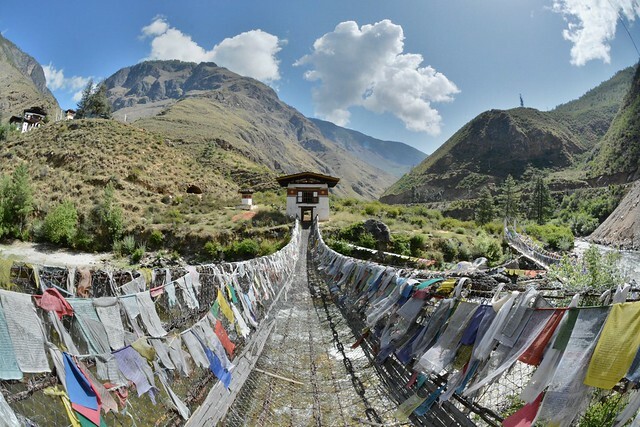 From prayer flags atop razor sharp mountains to homes lathered in mystical designs, religious iconography makes itself known at every turn serving as a constant reminder of people’s core values, goals and priorities. It’s almost impossible to “go off track” and lose sight of what’s important. 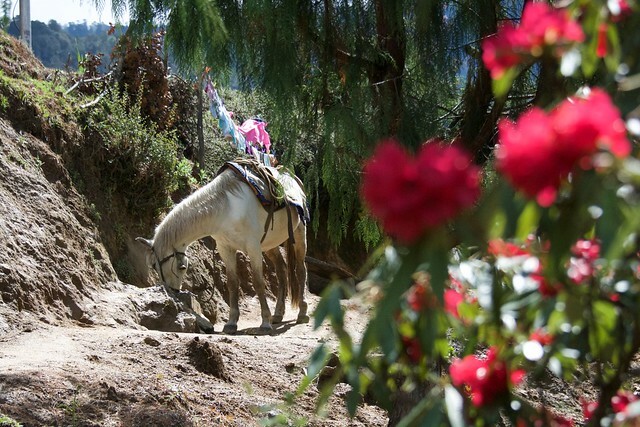 Rituals play an equally significant role in Bhutanese life. Meditation and seeking guidance from deities or monks are regular practices, helping people make focused decisions which are inline with their desired trajectory. Lesson #2: whatever your source of bliss (family, philanthropy, religion, sport, business, academia, art and beyond), it should be championed by your lifestyle. Don’t let it take a back seat while you get distracted by stress and humdrum routines. Create daily rituals which preserve and inspire your dreams. Set up visual queues, which keep your priorities top of mind. Live and breathe your core values. Build your happy place. 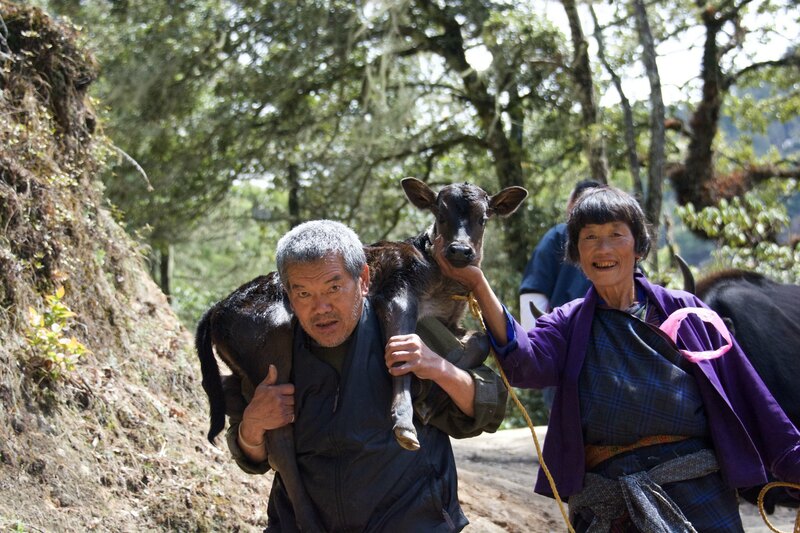 The Bhutanese are one of the most compassionate, community-oriented races on earth. They’re acutely aware of suffering and actively help those facing hardship. Even a poor farmer with little to give will offer what he can to those in need. So it seems, brightening someone’s day offers the ultimate compensation – the “feel good factor”. One night, Ben and I were being attacked by some particularly aggressive mosquitoes. We started swatting them with our hands, hoping to terminate the little tykes. All the while, our guide sat calmly and did nothing. When we asked him why, he said he couldn’t intentionally kill a living creature as it would bring about bad karma. Plus, he didn’t mind sharing his blood with the mozzies, as they needed it to survive. Needless to say, we felt pretty guilty after that. To sum things up, the Bhutanese believe every action inspires an equal reaction. When you act selfishly or cause harm to others, it’ll leave a bad taste in your mouth and come back to bite you. If you’re compassionate and generous, you can rest easy and trust that help will find you when you need it. Lesson #3: Helping others breeds happiness, inner peace and a sense of security. 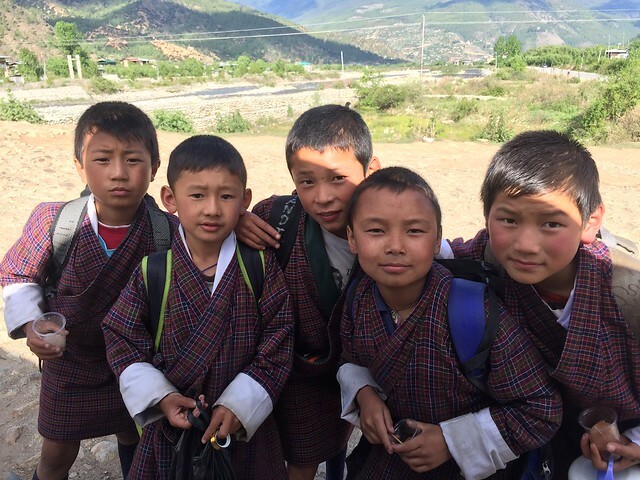 From they day they’re born, the Bhutanese learn to find happiness in the simple life. 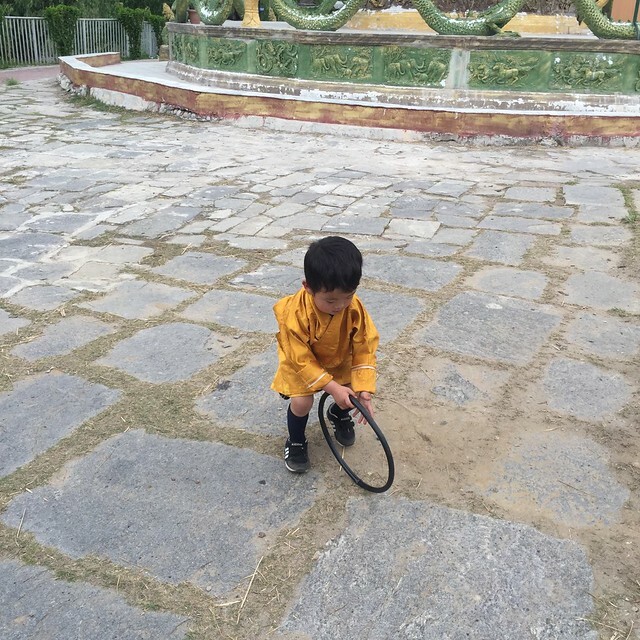 Kids play with blades of grass, sticks or worn out rubber tires. If these things break or go missing, no worries. They’re free and easy to replace. Western children, who tend to prefer the latest techno-gadgets, are much more susceptible to stress, anger, envy and other negative emotions. What if my Playsation is older than yours? What if my iPad won’t connect to the internet? What if my iPhone smashes and my parents have to spend hundreds of dollars on a new one? Lesson #4: get back to basics and avoid unnecessary stress. During my time at Tiger’s Nest Monastery, I had the opportunity to speak with a monk. He said it was a difficult path to take as a young boy because he didn’t have access to certain luxuries (e.g. TV) like other children. But, as time went on, his contentment surpassed his peers’, as they’s acquired the stresses of family, work, city and contemporary life. 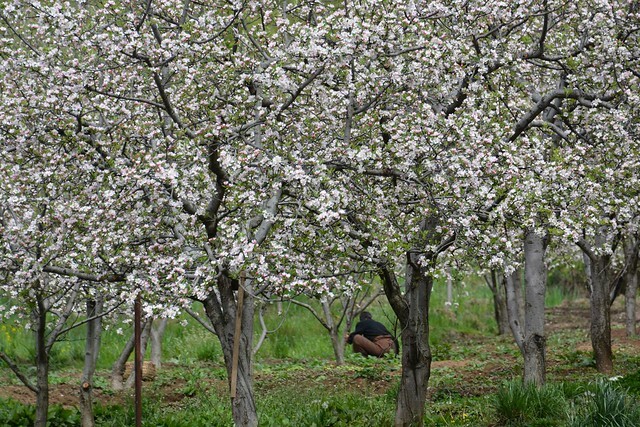 The monk, on the other hand, spent his days meditating and studying Buddhism in the company of nature. His life was simple, yet completely fulfilling. I’m not saying the path of a devout Buddhist monk or nun is the only way to find happiness. The principle of omitting unnecessary stresses from your life and taking time to enjoy simple pleasures has merit. For me, baking a cake, reading a book and chatting to my mum bring me more smiles than my inbox. Yet, the latter gets a lot more of my time. It makes absolutely no sense. It’s hard to imagine a government which genuinely champions equality amongst its people, makes decisions for the good of all, and protects the environment. But, Bhutan’s leaders seem to be doing exactly that, achieving Gross National happiness along the way. What’s they key to their success? They take things one step at a time. Acting in haste to keep up with the rest of the world is not Bhutan’s style. Until the 1960’s it had no roads, automobiles, telephone, postal system or electricity. Limited access to TV and the internet wasn’t enabled until 1999, once people had been taught how to manage the pros and cons of this technology (dinner in front of the telly with everyone absorbed in mobile phones doesn’t constitute family time in Bhutan). This cautious country has been so patient with its decisions, it’s managed to skip the horrors of the Industrial Revolution and jump straight to the 21st century. With a strong focus on sustainability, it’s become the only “carbon sink” in the world; Bhutan actually creates more energy than it uses! Unlike most of Asia, its towns are in spit spot condition. Litter is scarce, electrical wires are hidden, buildings look immaculate, pollution is undetectable and operations run smoothly. 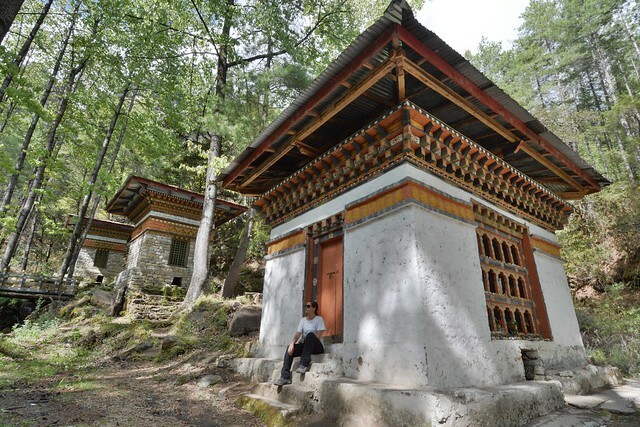 Taking time to observe the experiences of other countries, Bhutan has been able to get things right for the good of its people and the environment. While signs of democracy are steadily weaving their way into Bhutan, this transition isn’t being rushed either (Bhutan had its first general election in 2008). To ensure the divide between rich and poor doesn’t spiral out of control, the government is balancing the scales with an egalitarian approach. This can be seen in Bhutan’s management of tourism. It cost Ben and me $2500 as a couple to tour the country for a week. The majority of this tariff was absorbed by the government and distributed throughout the community (focusing on areas in need, e.g. regional housing development). This means, the entire country benefits from tourism, not just the operators. Even the Royal Family is working hard support less affluent communities. Due to the small population of Bhutan (approx. 700,000), it’s able to keep its finger on the pulse and recognise those who are underprivileged. Heading a number of charities which ensure people’s basic needs are met (especially in remote communities), the royals (and NGOs) are careful not to go overboard. Their perspective? If the people are happy as they are, why try to change them and and inject dissatisfaction into their lives (i.e. a desire for more)? Lesson #5: Think before you act; take your time considering the outcomes; and, make a decision which supports the well-being of all parties involved – there’s always a way. This will inspire loyalty, trust, unity and contentment amongst the community. This philosophy rings true when it comes to leading countries, families, interest groups and beyond. After visiting Bhutan, I was in two minds. One one hand, I felt deeply saddened by the experience. It made me realise how much suffering, negativity, discord and inequality was being nurtured by other countries. Crossing the border from Bhutan straight into India was a shock to the system! On the flip side, Bhutan was proof that purity still existed in the world. I was surprised and delighted by this unassuming country, which genuinely felt like the happiest place on earth. 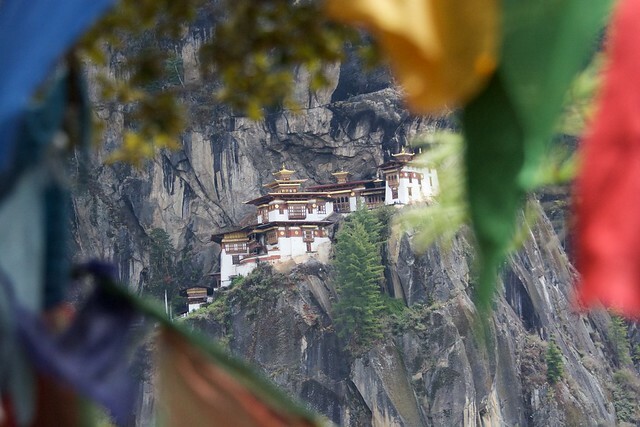 Bhutan has so much to teach the world, I hope it marches to the beat of its own drum for many years to come.